Mix-up • Errant form also lists old address next to warning that false information could be a misdemeanor. 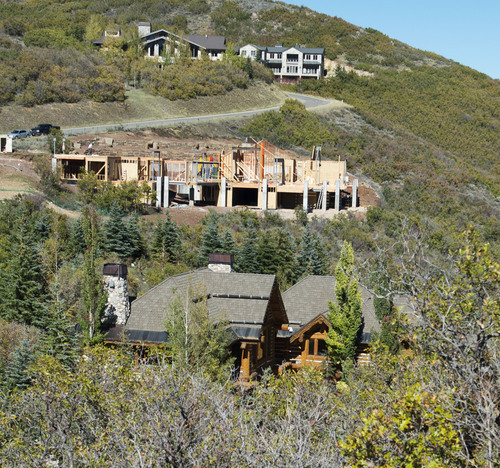 Steve Griffin | The Salt Lake Tribune Mitt Romney has registered to vote in Summit County as unaffiliated and is using his old address as his residence at this home, bottom, in Park City, Utah. The home was photographed Thursday, October 2, 2014. 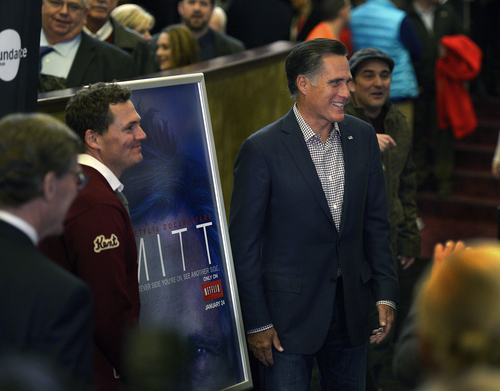 Scott Sommerdorf | The Salt Lake Tribune Mitt Romney poses for photos with Greg Whiteley, left, the Director of "Mitt" as he arrives at the Sundance Salt Lake City Gala featuring the documentary "Mitt" at the Rose Wagner Theater in Salt Lake City, Friday, January 17, 2014. 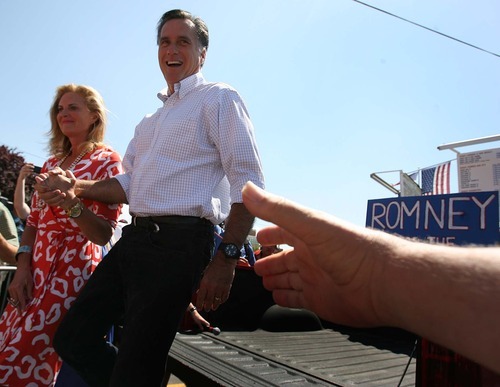 Leah Hogsten | Tribune file photo In this archive photo, Republican presidential hopeful Mitt Romney makes a public appearance with his wife, Ann, at the Hires Big H Drive-in in Salt Lake City. FILE - Republican presidential candidate former Massachusetts Gov. 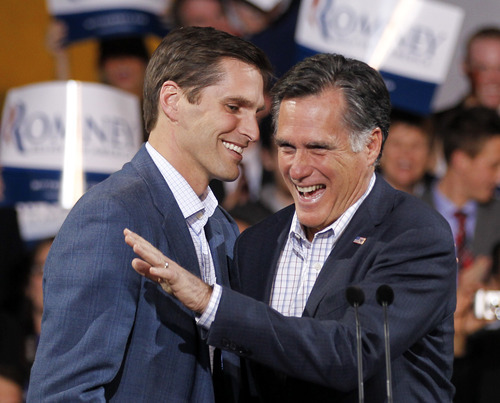 Mitt Romney arrives for an election night rally with his son Josh in Denver, Tuesday, Feb. 7, 2012. (AP Photo/Chris Carlson) A voter registration form, signed by Mitt Romney in August, shows him registering to vote at his former home and does not include a party affiliation. State election officials say there was a clerical error that led to the form being pre-filled with outdated information. The form was obtained through a government records request by The Salt Lake Tribune Republican presidential candidate former Massachusetts Gov. Mitt Romney waves on stage with his son Josh, left, at his Colorado caucus night rally in Denver, Tuesday, Feb. 7, 2012. 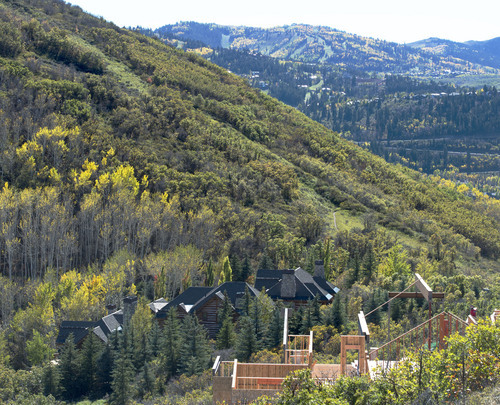 (AP Photo/Gerald Herbert) Steve Griffin | The Salt Lake Tribune Mitt Romney has registered to vote in Summit County as unaffiliated and is using his old address as his residence at this home, bottom, in Park City, Utah. The home was photographed Thursday, October 2, 2014. Washington • Mitt Romney, whose name keeps popping up as a possible three-time presidential candidate, would be wise to read legally binding documents before signing them, as demonstrated by a Utah voter-registration gaffe that appeared to have him shunning his Republican Party for independent status and using a home address he couldn&apos;t legally claim since 2009. The suspect voter-registration form popped up in Summit County, where County Clerk Kent Jones provided it Thursday to The Salt Lake Tribune in response to a public-records request. 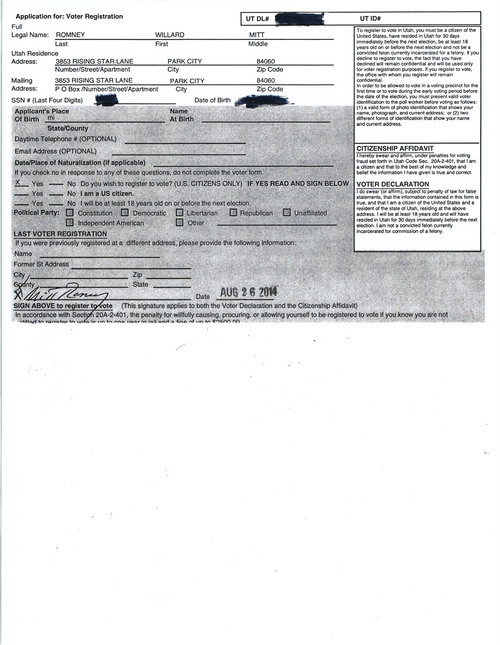 A copy of the form shows Romney&apos;s signature with his old address listed in two places beside warnings that providing false information on the registration document is a misdemeanor violation of Utah law. It turns out Romney, who is moving to Utah as a full-time resident, strolled into a driver license office in late August to obtain his Utah license and filled out paperwork to register to vote at his under-construction home in Holladay, a suburb of Salt Lake City. But, apparently because of outdated information in the agency&apos;s database, the pre-printed form listed Romney&apos;s former Park City address on Rising Star Lane and with no party affiliation. Romney signed it. The move flummoxed state elections officials and Romney aides, when The Salt Lake Tribune inquired why the two-time presidential candidate was registering as an unaffiliated voter with his listed residence at a home he sold five years ago. As they explained it, some star-struck clerks and Romney&apos;s inattentiveness may have combined to cause the problem. 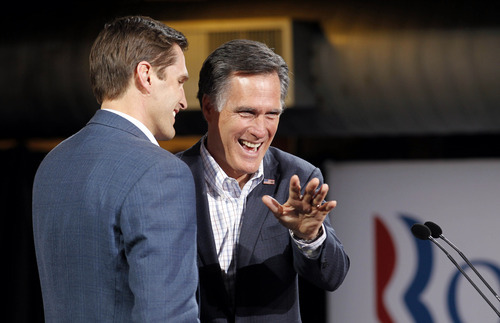 Utah Elections Director Mark Thomas said Thursday that the driver-license clerk printed out Romney&apos;s registration form before updating his new address. His license, Thomas said, bears the correct Holladay address. "It was an error on the clerk&apos;s fault," Thomas said. "They&apos;re getting a new registration form [mailed] out." The mistake was just that and there was no intent by Romney to provide false information, Thomas said. Romney had gone to update his address and that&apos;s what he thought he was signing. The elections director noted that there was a bit of a circus atmosphere at the driver license division when Romney, a wildly popular political figure in the state, walked into the office. "This must be a purely clerical error," Josh Romney, Mitt Romney&apos;s son, said earlier Thursday when asked about the registration information. Romney recently sold his Belmont, Mass., condo and decided to make his home in Utah, where he is building a home in Holladay next to Josh. Mitt Romney and wife, Ann, also own a multi-million-dollar mansion in Deer Valley that they purchased last year. A Romney aide said that both Mitt and Ann Romney have Utah driver licenses and are in the process of registering to vote as Republicans. Romney had used the Park City home on Rising Star Lane as his Utah residence when he led the 2002 Winter Olympics in Salt Lake City but kept his voter registration at his then-home in Belmont, Mass. He continued to vote there as well. Race-car driver Hal Prewitt purchased Romney&apos;s home on Rising Star Lane in 2009 and extolled the former home owners&apos; values in an open-letter during the 2012 presidential election. Prewitt even noted that Romney was so fiscally conservative that he purchased wood from Home Depot to box up his family&apos;s belongings instead of hiring a full-service moving company.